One of the goals for 2017 was to see some new butterfly species. 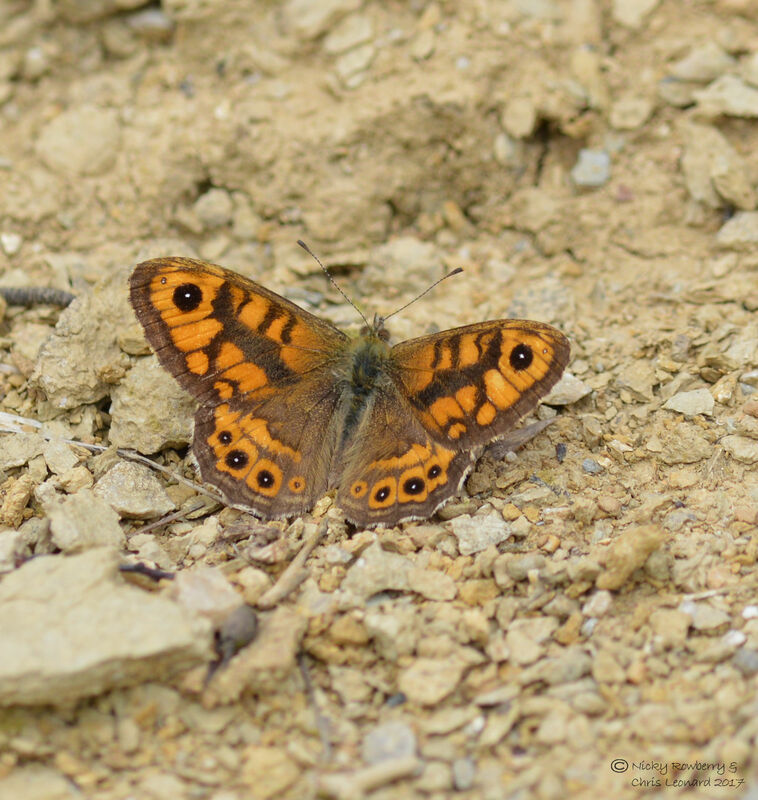 So yesterday we set out for Lea Quarry at Wenlock Edge, in search of the Wall butterfly. 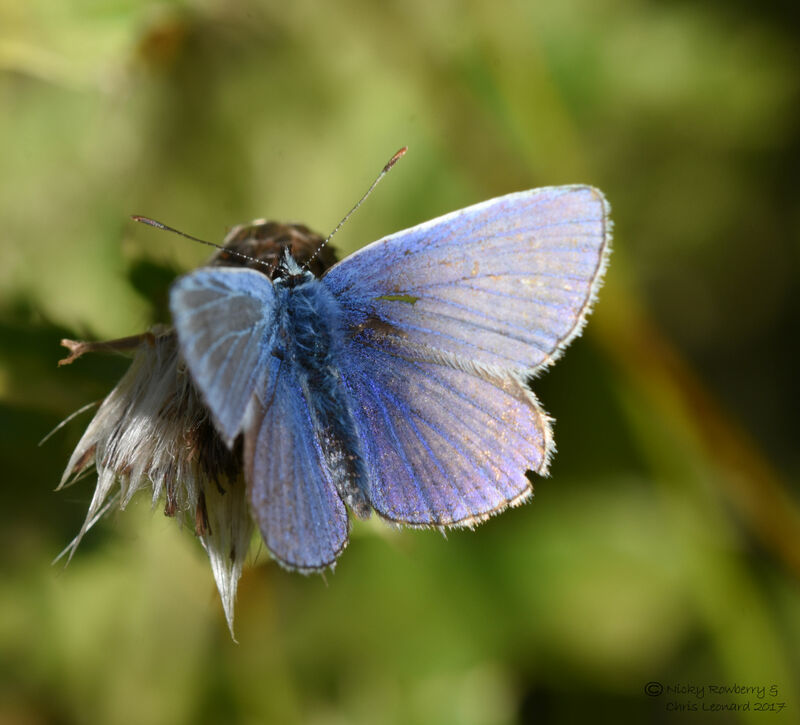 The excellent “Butterflies of the West Midlands” book recommended Lea Quarry as a hotspot for Walls in August, so off we went. As usual we nearly managed to get lost as soon as we left the carpark, thanks to someone removing an arrow sign from the path trail! Fortunately while we puzzled over which way to go, a very helpful butterfly spotter Roger (and his gorgeous Malamut dog), showed us the correct path and in fact led us straight to our targets. 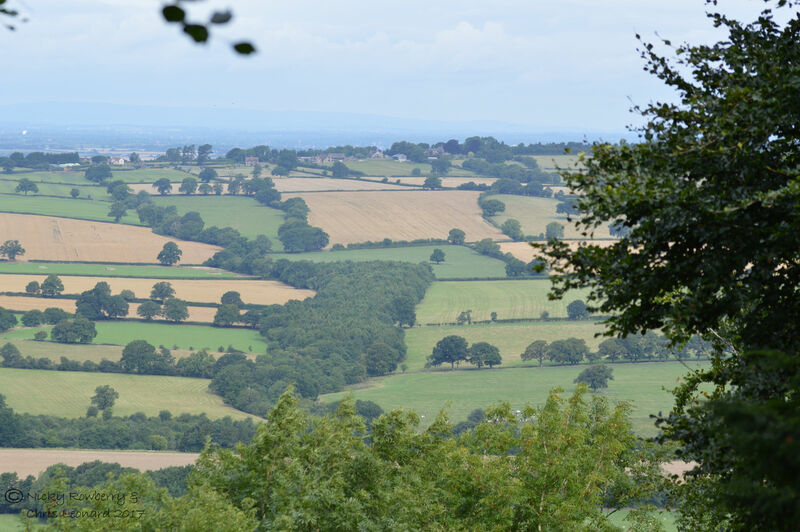 Wenlock Edge is a narrow limestone escarpment and Lea Quarry is just as it sounds – a quarry. From the path there are lovely views out over the Shropshire countryside. 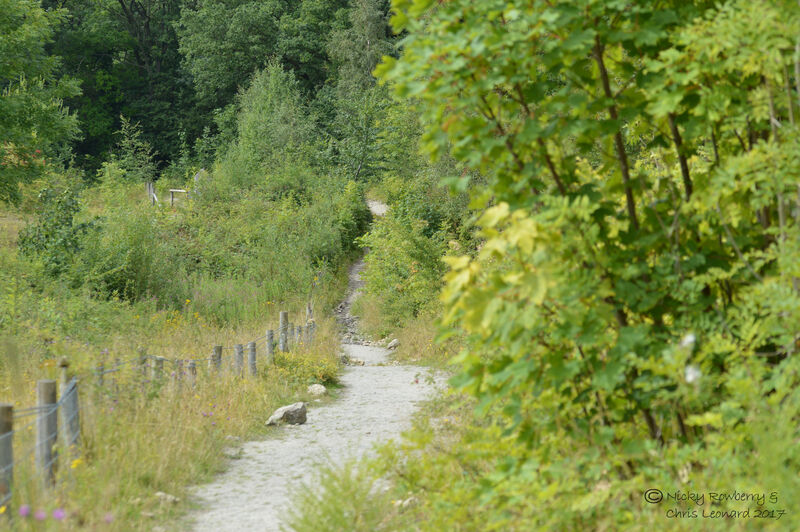 The path runs along the Edge with the quarry to one side. 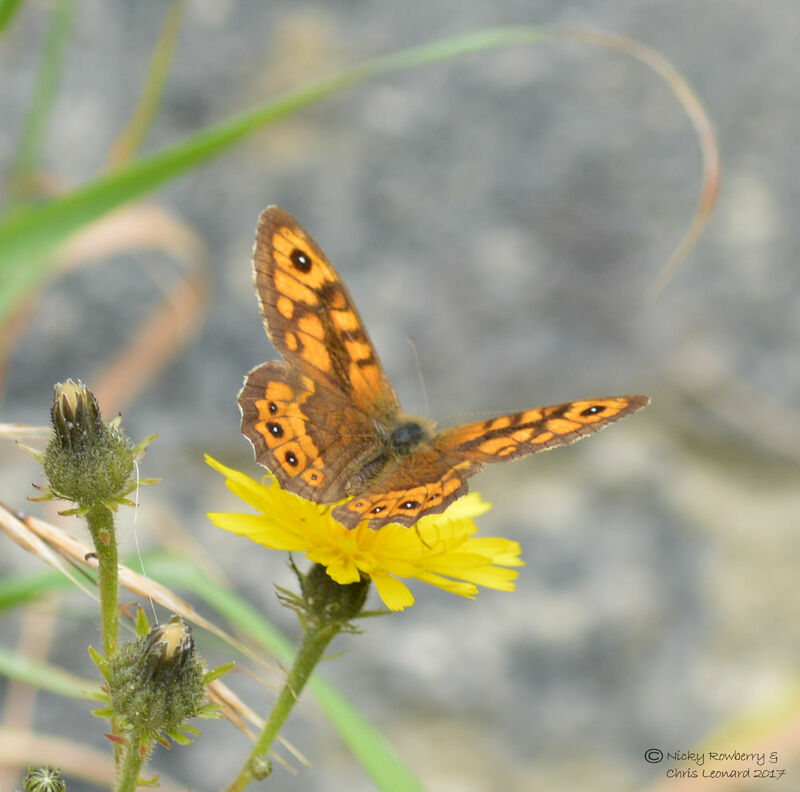 The butterflies congregated on a small rocky slope at the side of the path. 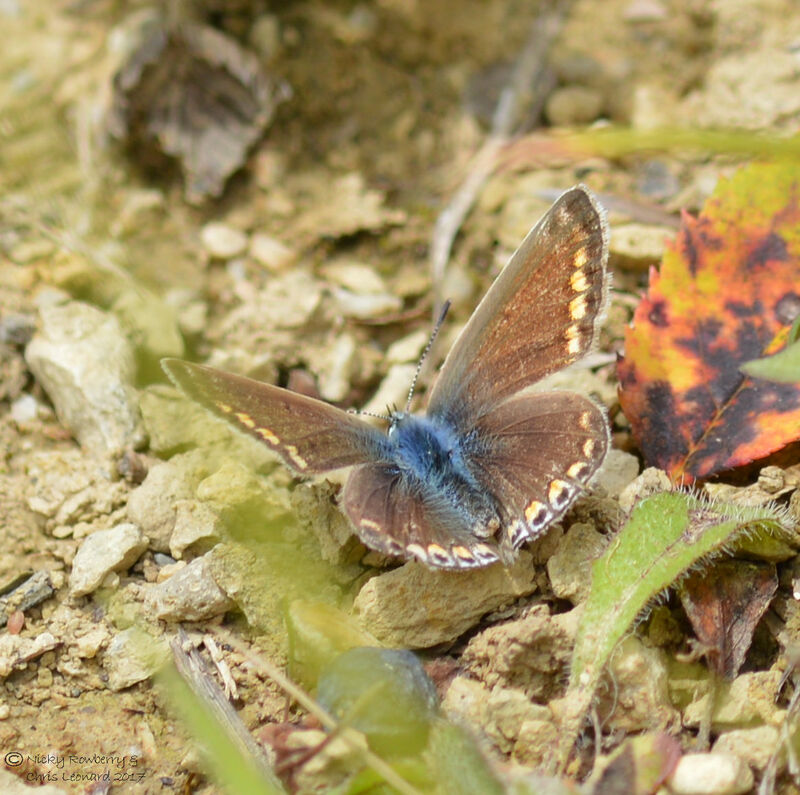 The area may not have been very big, but it was full of butterflies – we counted 11 species. 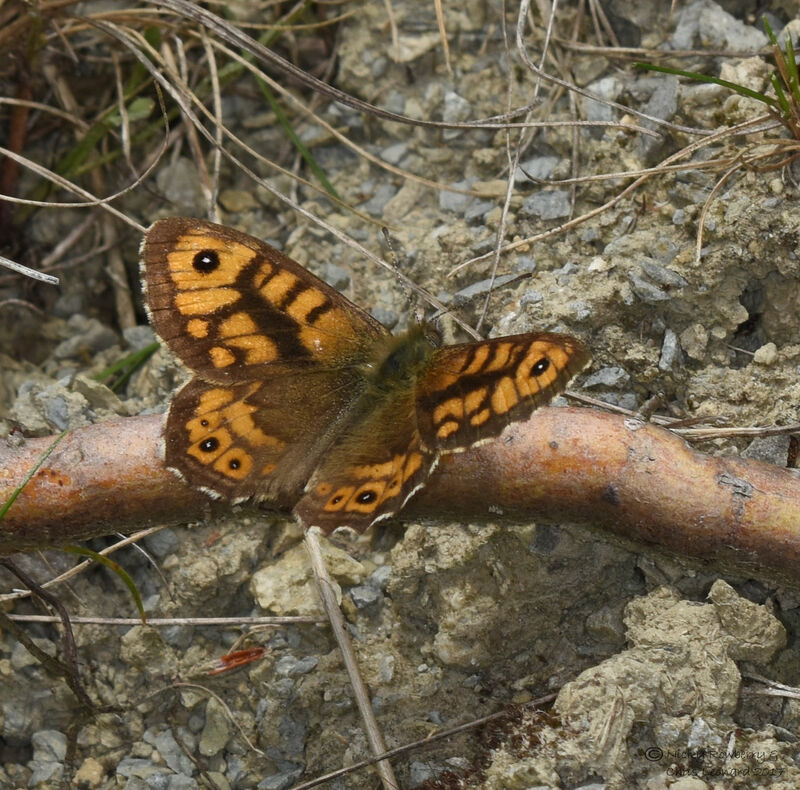 Most were common ones like Gatekeepers, Speckled Wood, Comma, Holly Blue, Meadow Browns and Whites. There were a couple of large and fresh looking Peacocks which were jostling for position over the same flowers. 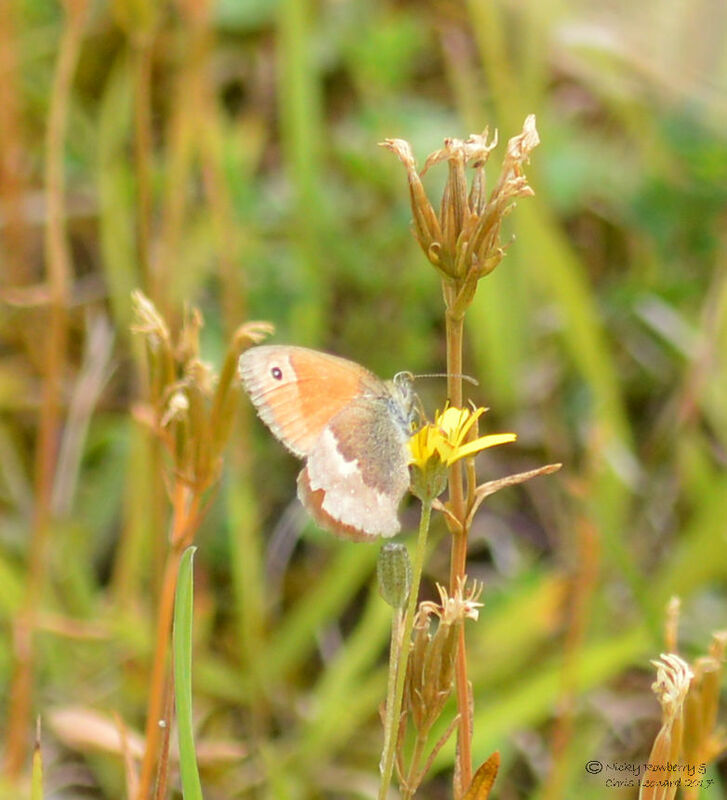 There was also one Small Heath, which was more unusual to us. 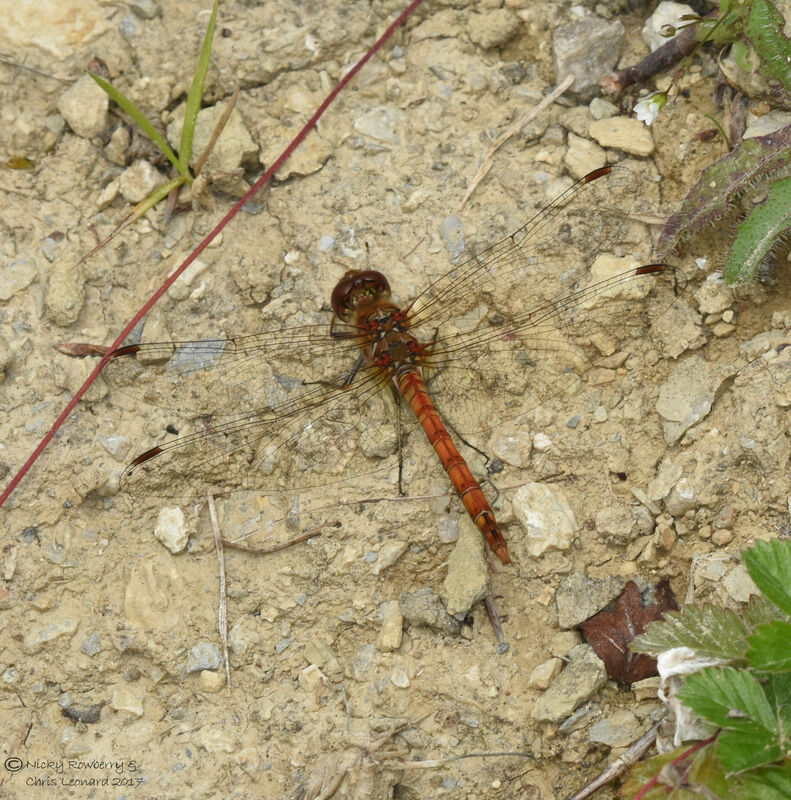 It skulked about in the undergrowth a bit though and looked generally a bit tired, so we only managed this poor photo. 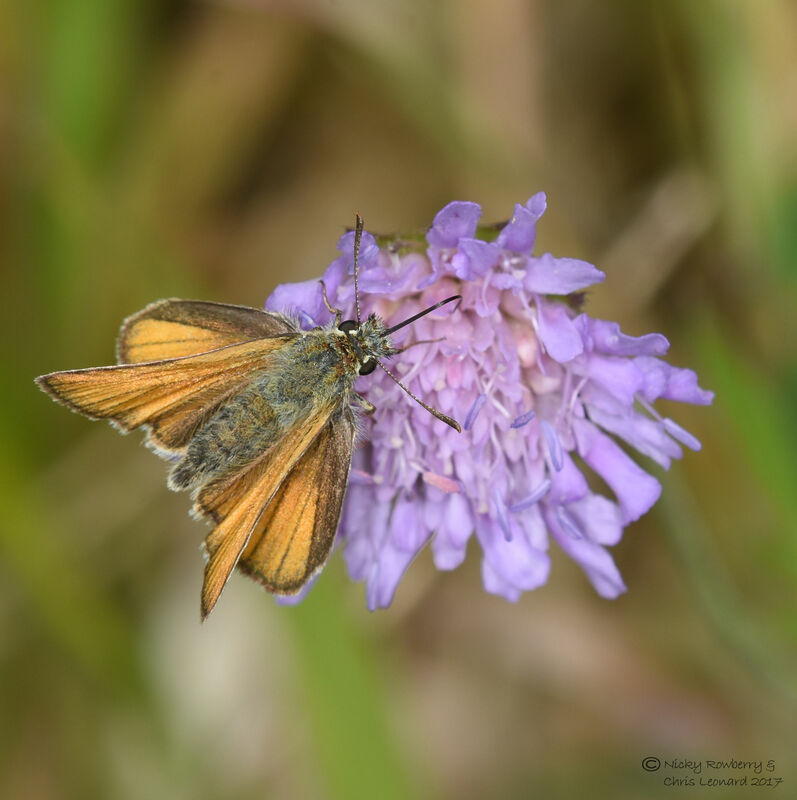 A Small Skipper was much more obliging, posing happily right in front of us. 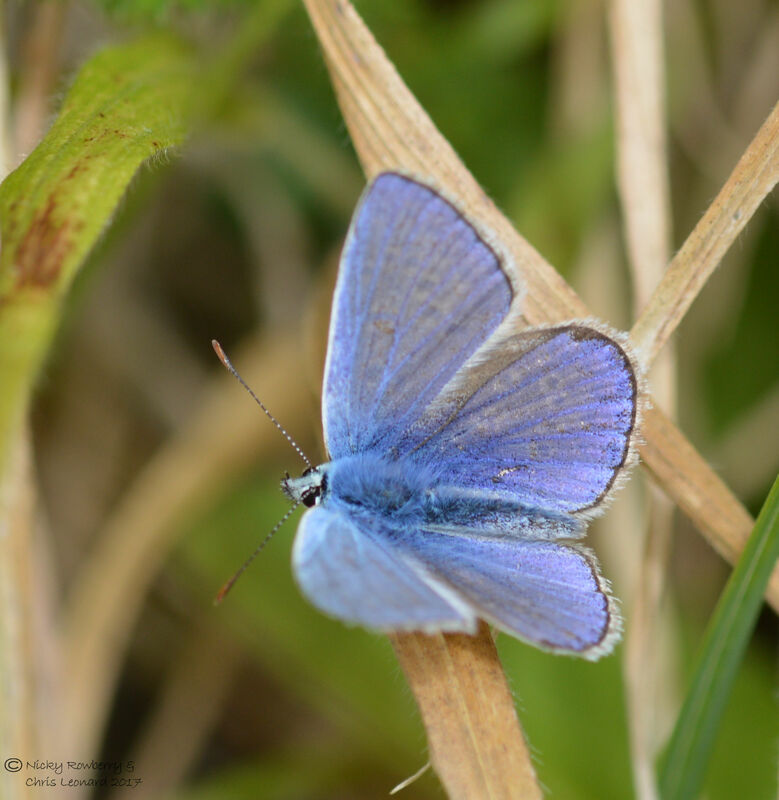 Common Blues were reasonably common and the males were very blue! 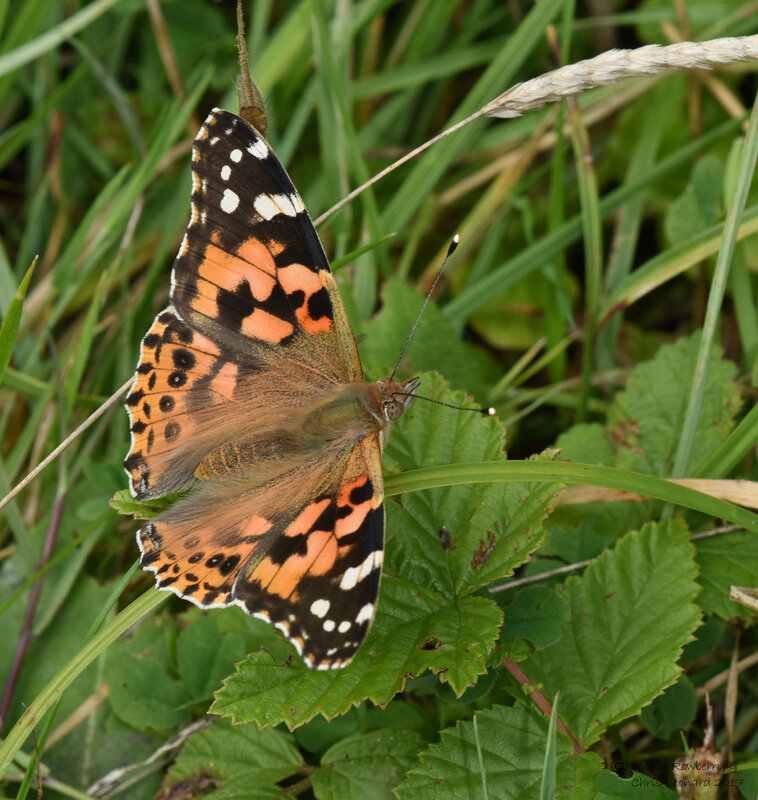 The poor female is of course the dowdier of the pair, but still very beautiful. But the main attraction were the Walls. 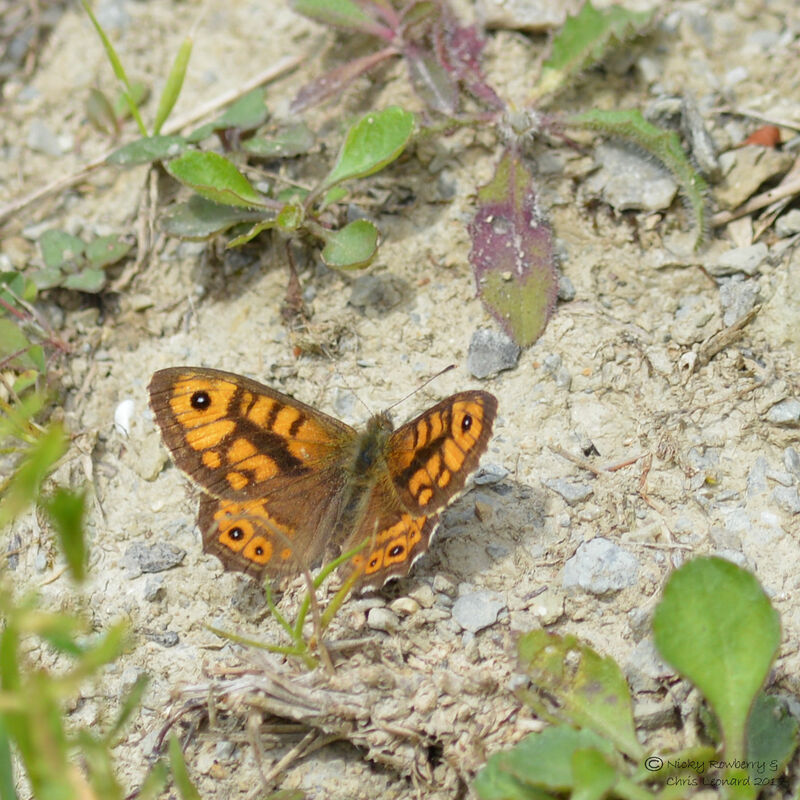 They’re medium sized butterflies and quite strikingly marked, yet were surprisingly difficult to spot unless they took off. They fly most when it’s sunny, so we were lucky the weather was kind to us and the sun shone down on the righteous! Roger pointed out our first ever one, but after that we were up and running. We saw several basking on the bare rocks. Unfortunately they do have a tendency to take off as soon as you approach with a camera, but we did eventually get a few decent shots of them like this. 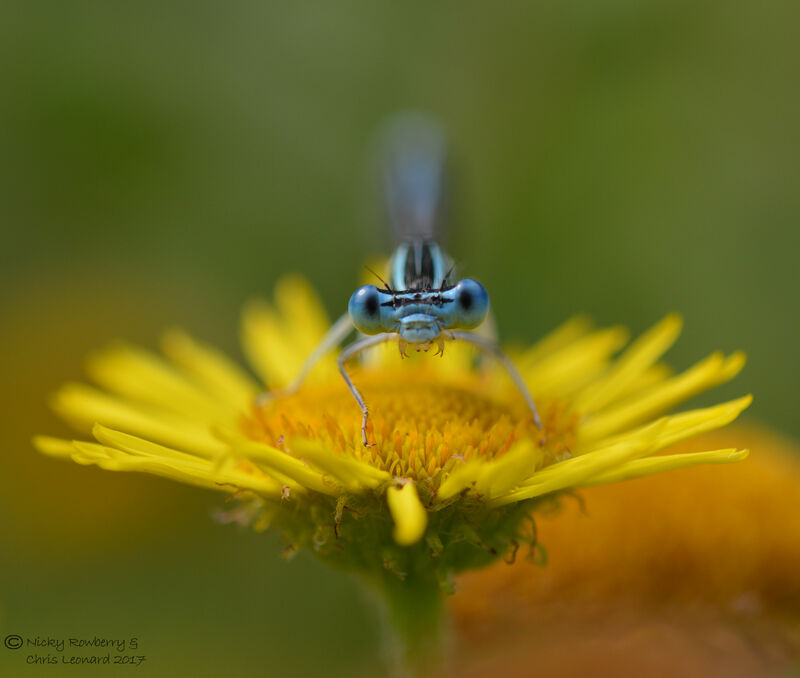 I did eventually manage to get a few photos of a Wall on a flower – only because I was trying to photograph something else and the Wall landed on the flower right next to me though – but hey, you take what you can get! 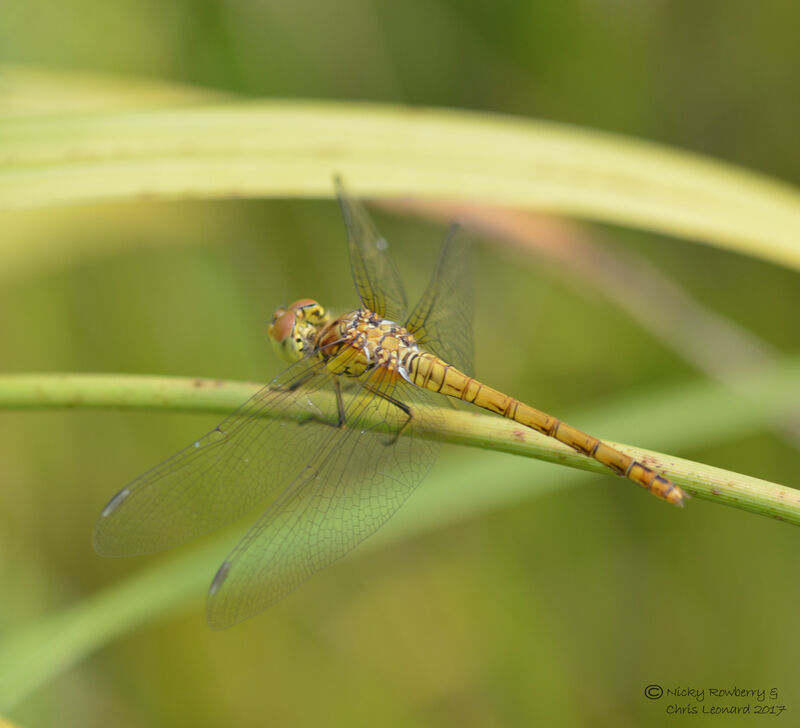 I didn’t realise until I looked back at the photos, just how beautiful the undersides of the wings are too. 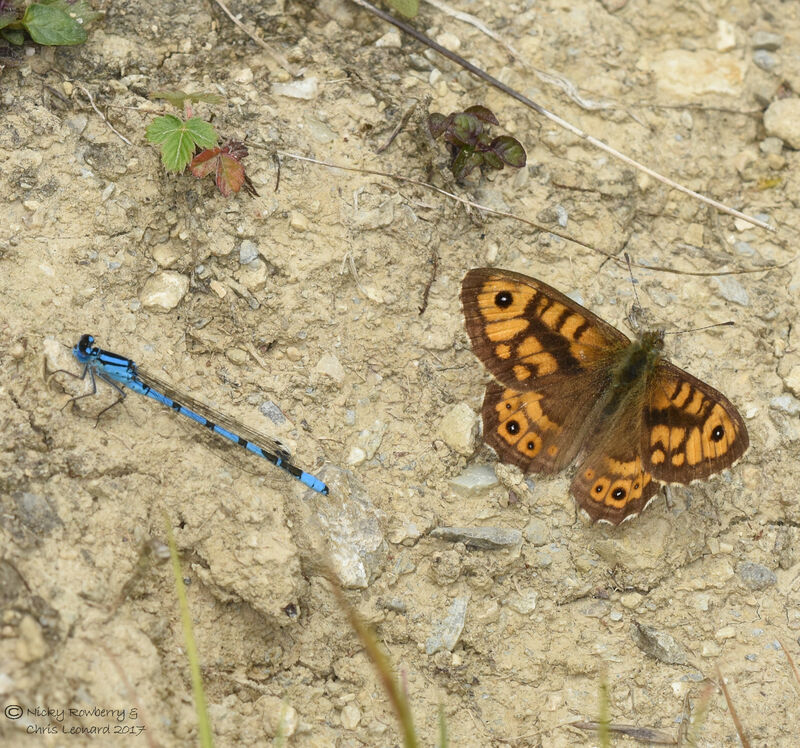 The stony bank was busy with insects of all kinds besides the butterflies. 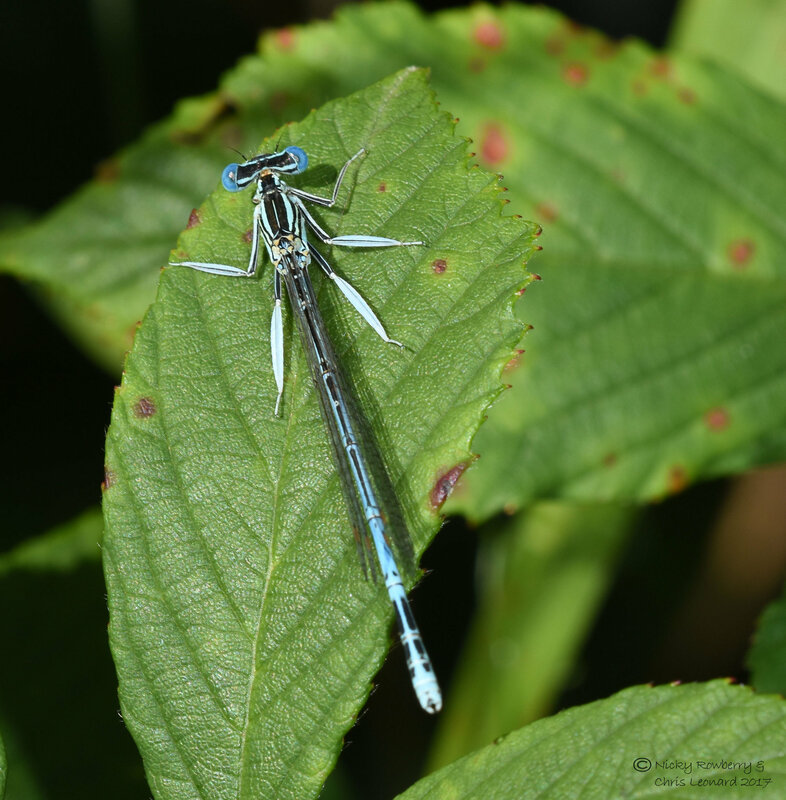 Common Blue damselflies were drifting about all over the place – even photobombing one of our Wall photos. 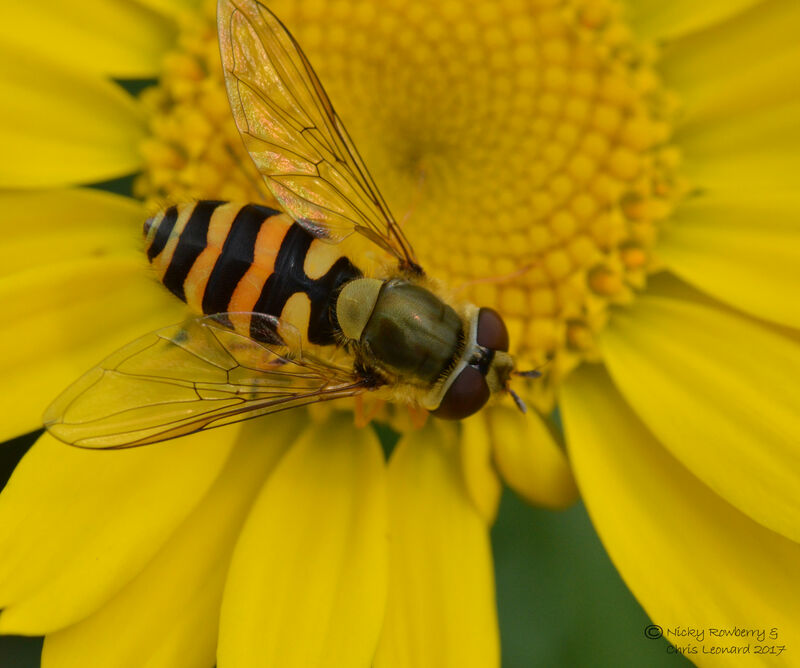 Bees and hoverflies were making the most of the summer flowers. 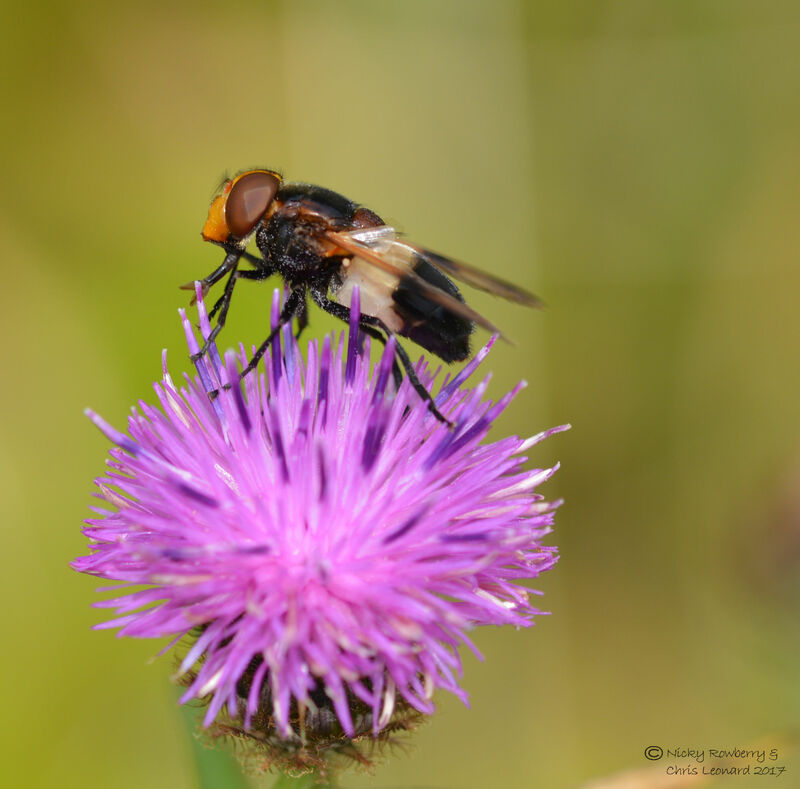 The hoverflies were particularly numerous and included this striking Large Pied Hoverfly (Volucella pellucens). 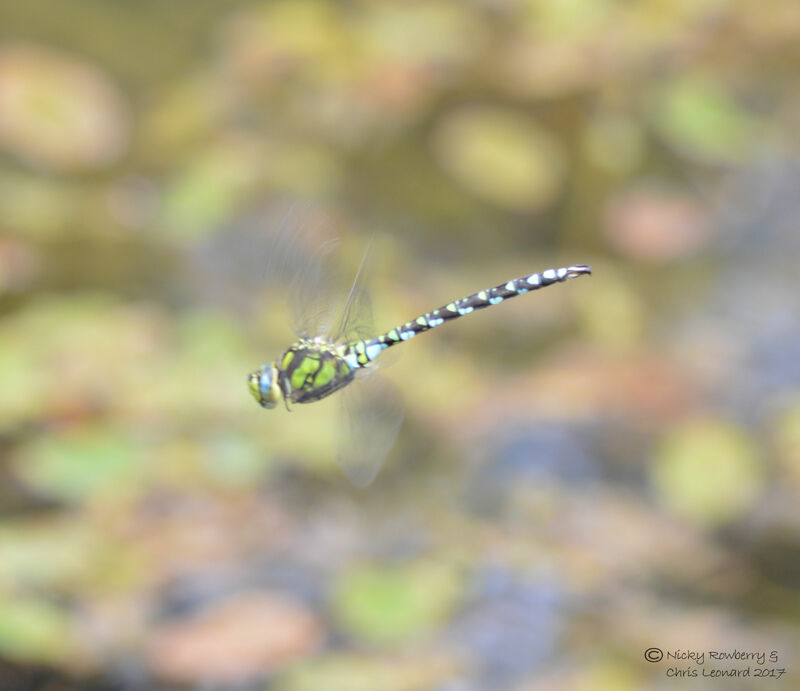 We could hear grasshoppers/crickets almost constantly – chirruping away enthusiastically in the sunshine. It was towards the end of our visit though before we actually saw one, when it hopped out onto the path. 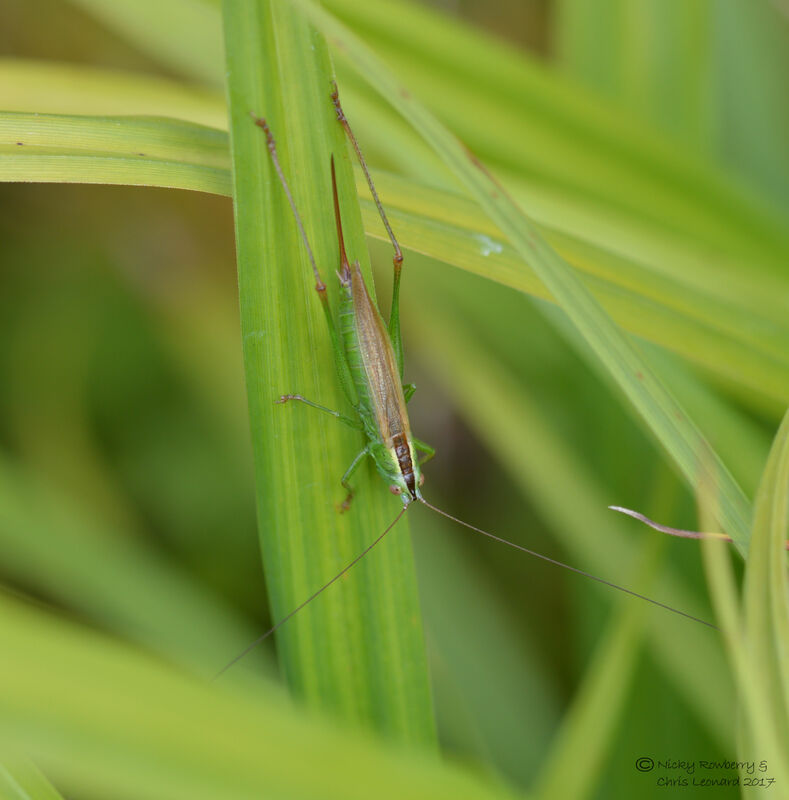 The relatively short and thick antennae indicate it was a grasshopper rather than a cricket, and that’s about as far as my ID got. 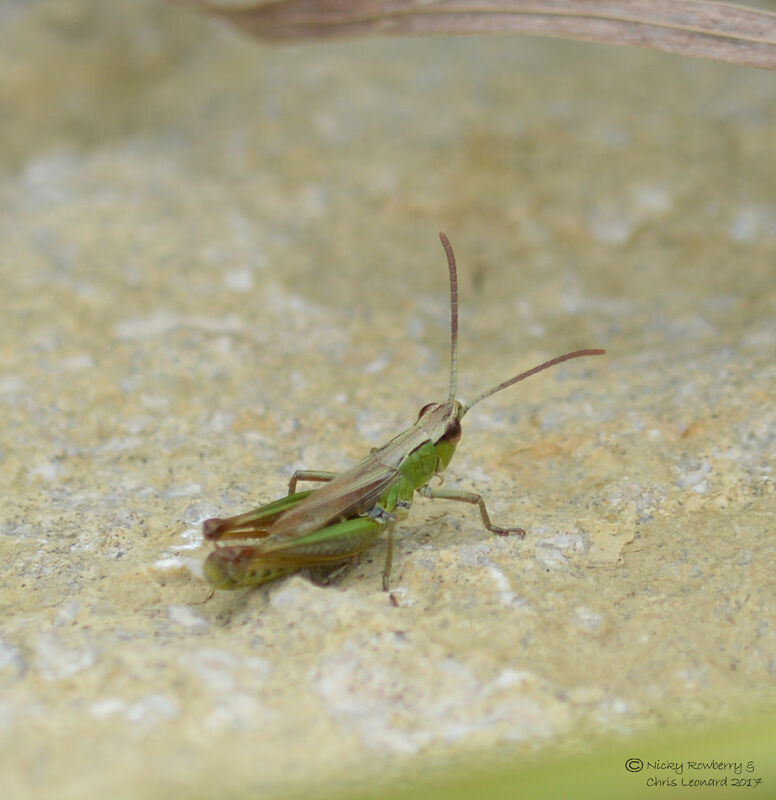 But thanks to Neil, it has now been identified as a male Meadow Grasshopper. 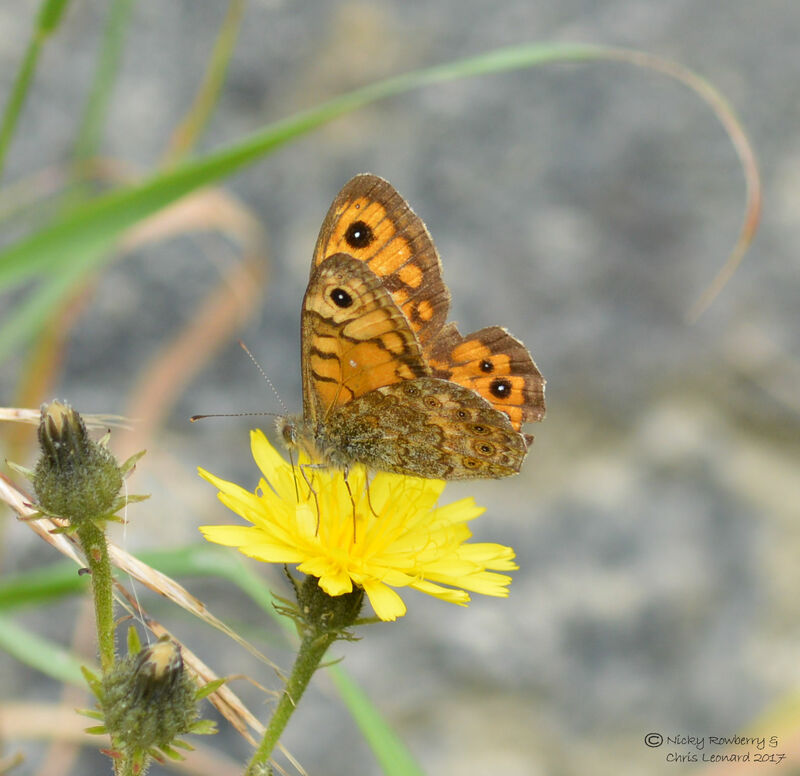 So the Wall takes our lifetime tally of butterflies to 43! Very happy with that, but already looking forward to adding to this. We’re probably too late to bag any other new ones this year, as we’d need to travel serious distances probably. 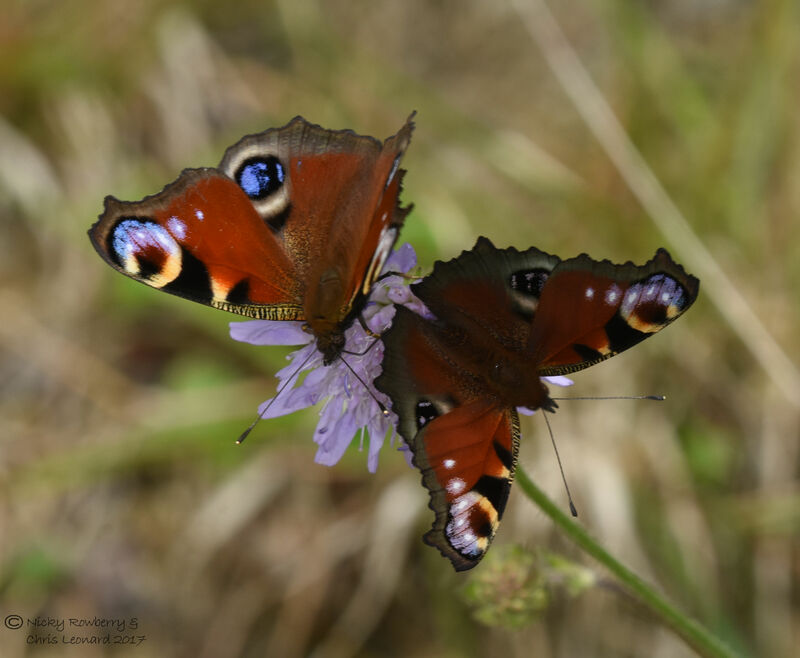 But with a bit of luck next summer, we might manage to creep a bit closer to the magic total of 59 – the generally recognised number of British species. It’s almost certainly going to get harder and we’ll have to travel further, but it’s nice to have a goal and a great way to get out and about, so we’re not complaining. 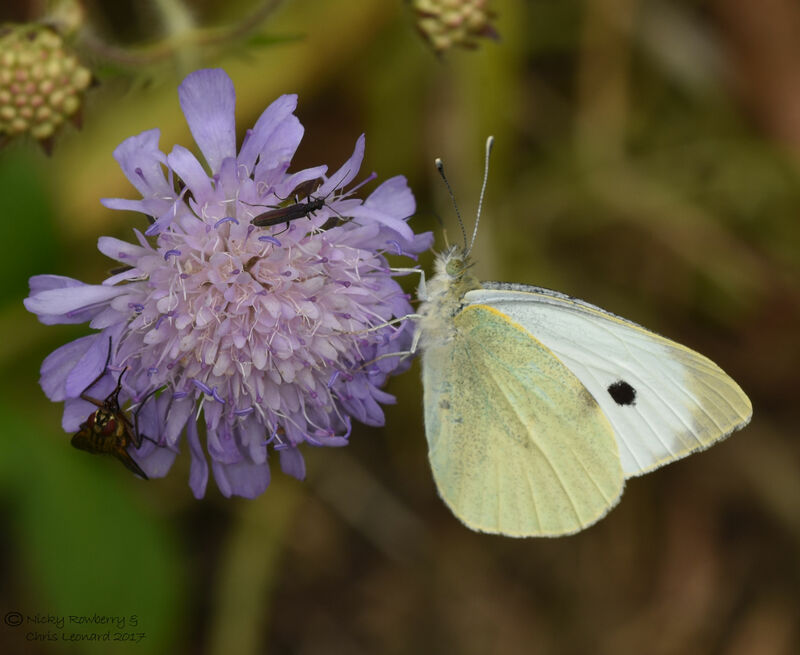 It has been a mixed week for us, but one thing that is definitely doing well is the population of pollinators in our garden. I’ve been meaning to do an update on our “Plant a Pot for Pollinators” pot for a while now. 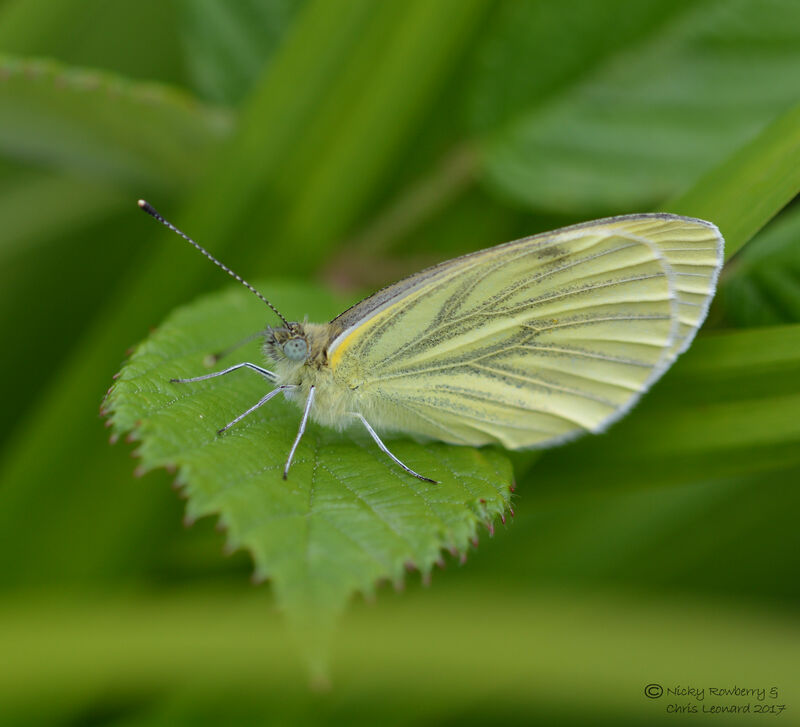 I started this post yesterday morning, but it’s taken until this afternoon to finish, as I keep spotting things buzzing round the garden and dash out to take more photos! When I planted the pot for pollinators back in June, the plants were all small and everything was neat and tidy (the only things in our whole garden that could be described thus). Now, just a month or so later, everything has gone a little bit wild and crazy and to be honest is fitting in with the rest of the garden much better for it. 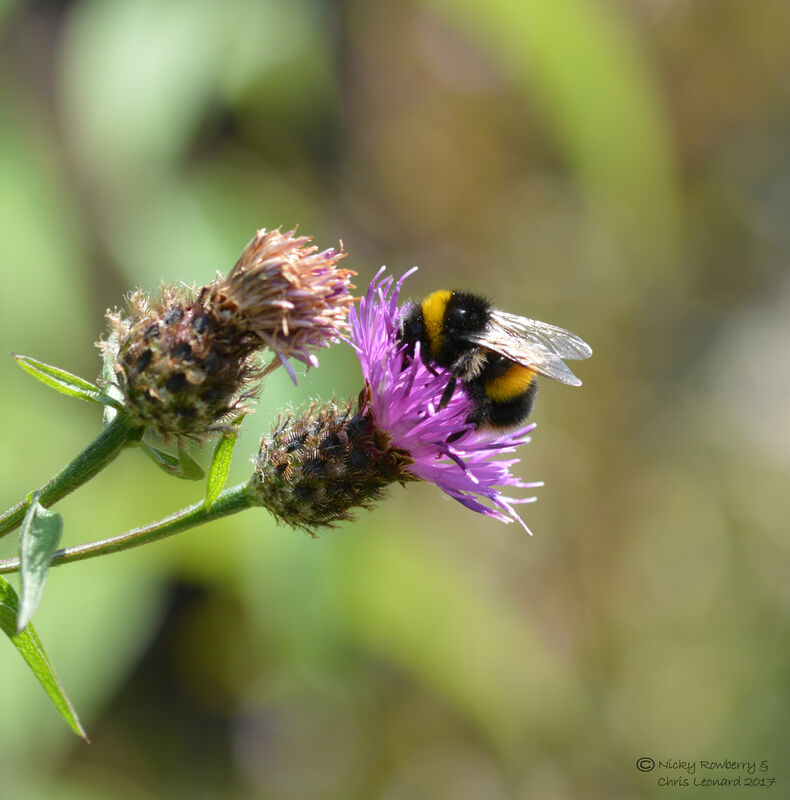 The flowers are all overflowing the pot, but the main thing is that it is buzzing with life – result! 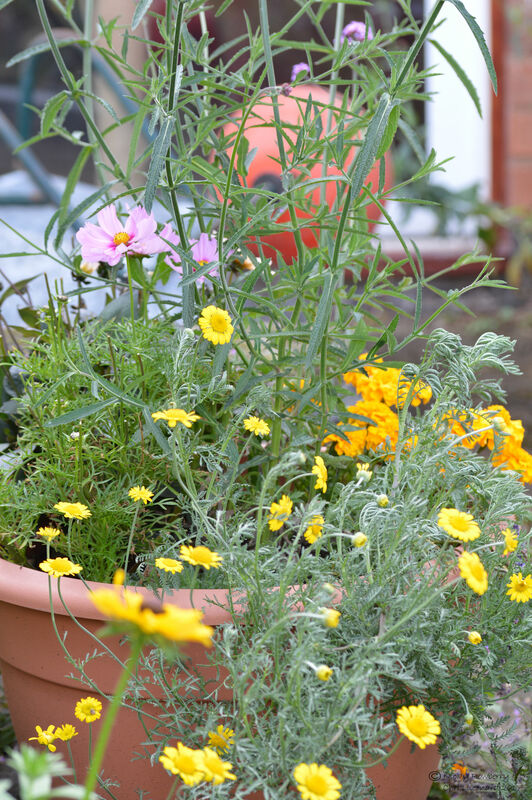 Being organic and unkempt our garden is generally not short of a pollinator or two, but it’s nice having a pot specifically planted with colourful flowers for them. 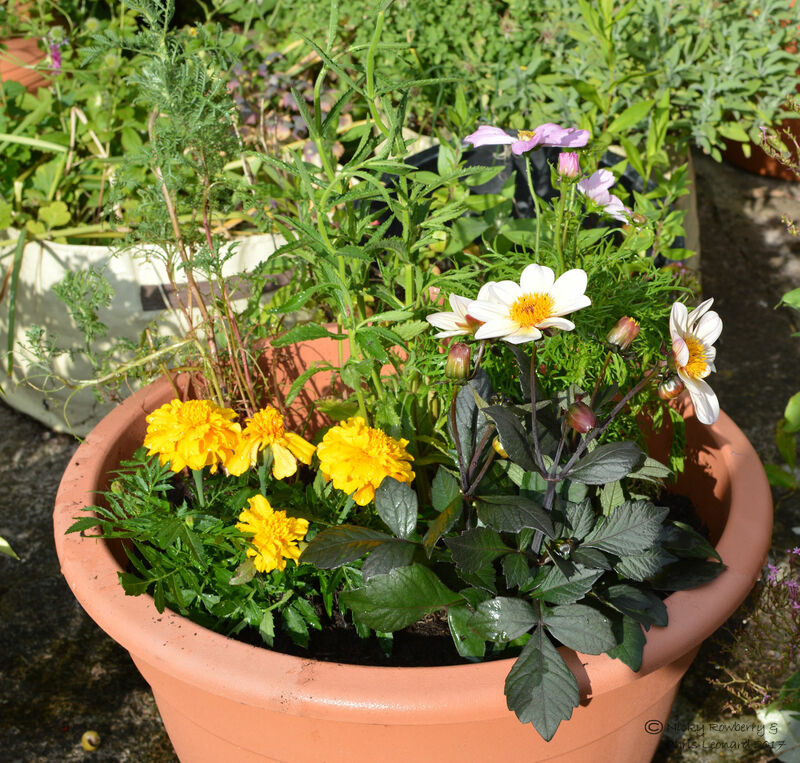 The hoverflies in particular seem to be making good use of the pot. 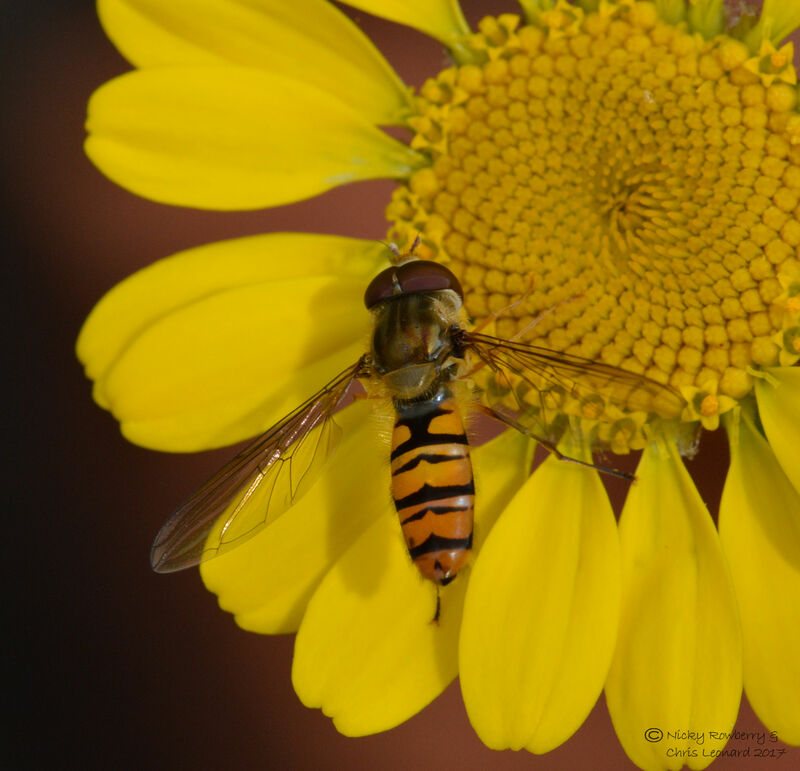 I am very much a beginner when it comes to hoverfly identification and there are an awful lot of species. 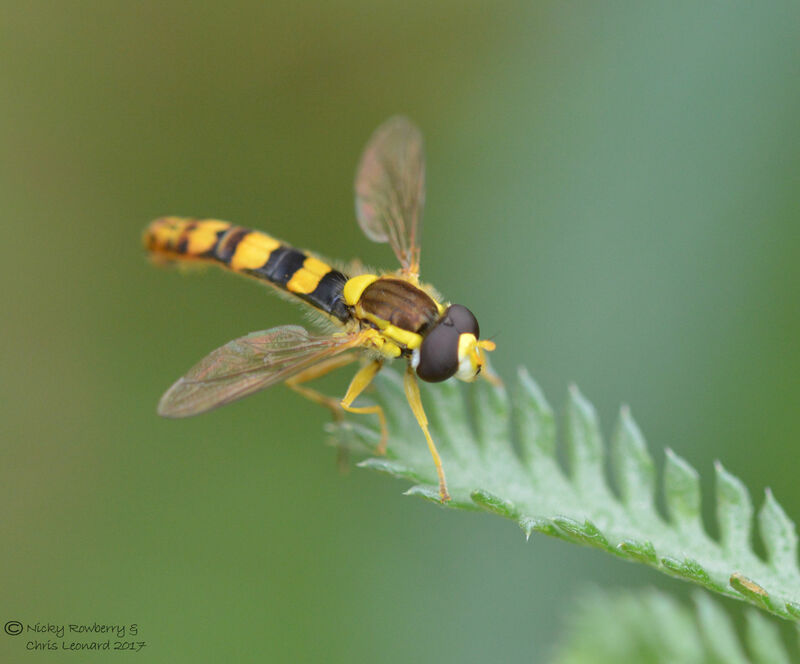 Fortunately with a helpful guide book and the even more helpful people on the hoverfly Facebook group, I’ve managed to establish that we’ve had at least 6 species visiting the pot over the last week. No doubt there have been more and hopefully I can add to that tally eventually. But here, in no particular order, are the 6 hoverflies. 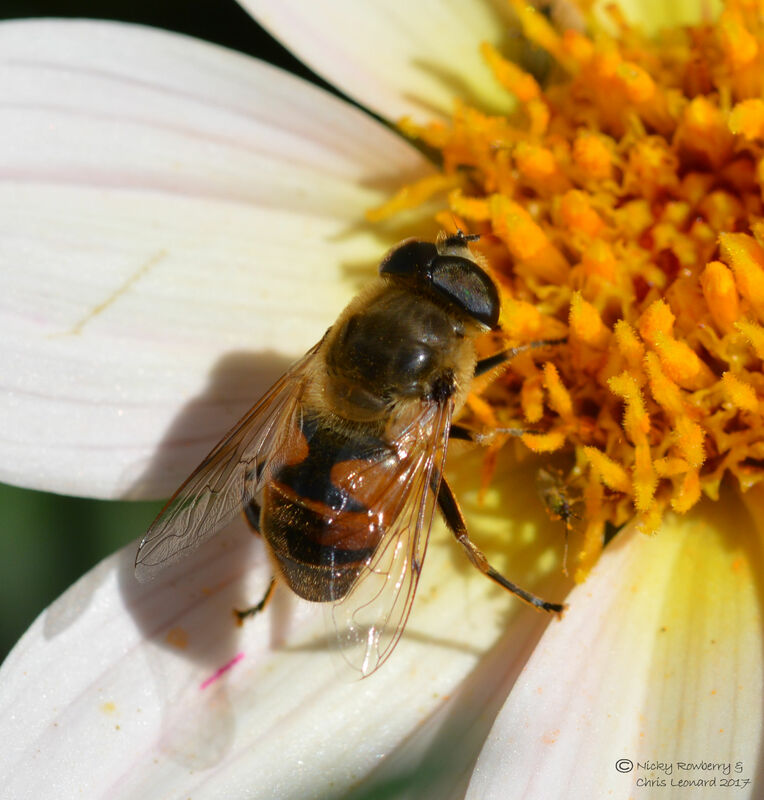 First up Britain’s most common hoverfly – Episyrphus balteatus aka the Marmalade Fly. 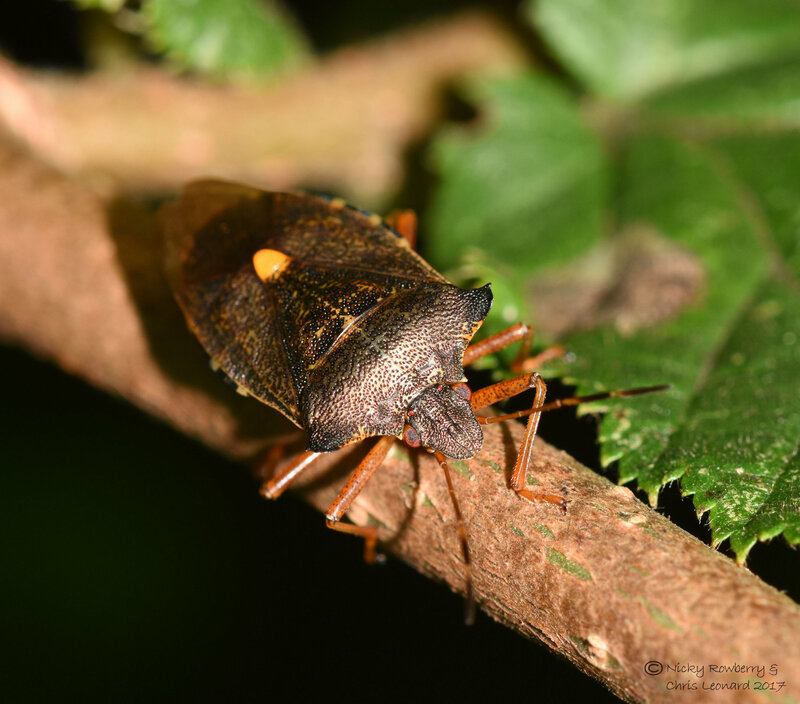 The stripes on its abdomen are supposed to look like the orange shreds in marmalade! Next up is one of the Syrphus species – difficult to get to species level without a microscope, so I’ll have to stick with the genus. 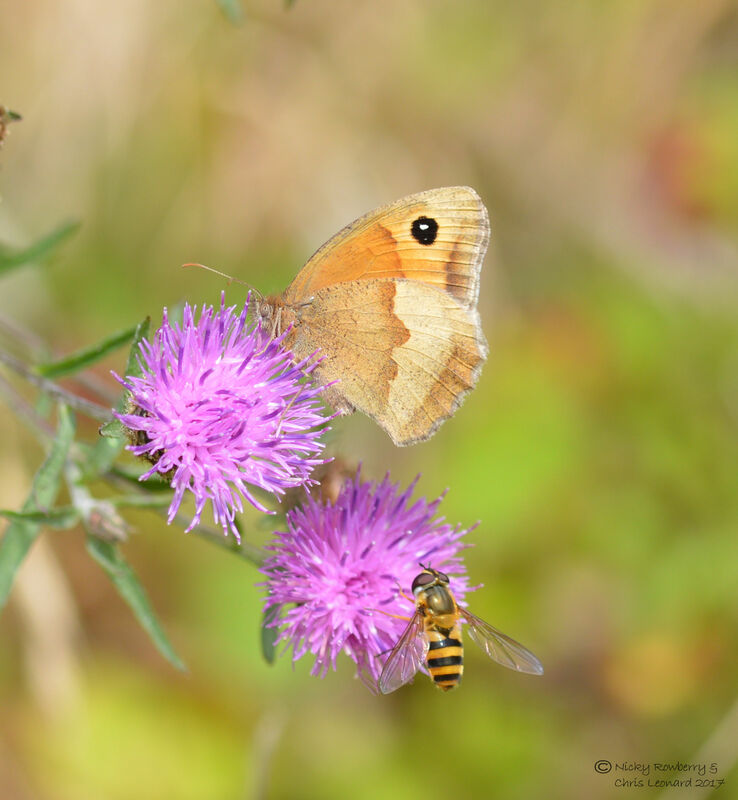 Another common one next – Eristalis tenax, one of the bumblebee mimics. 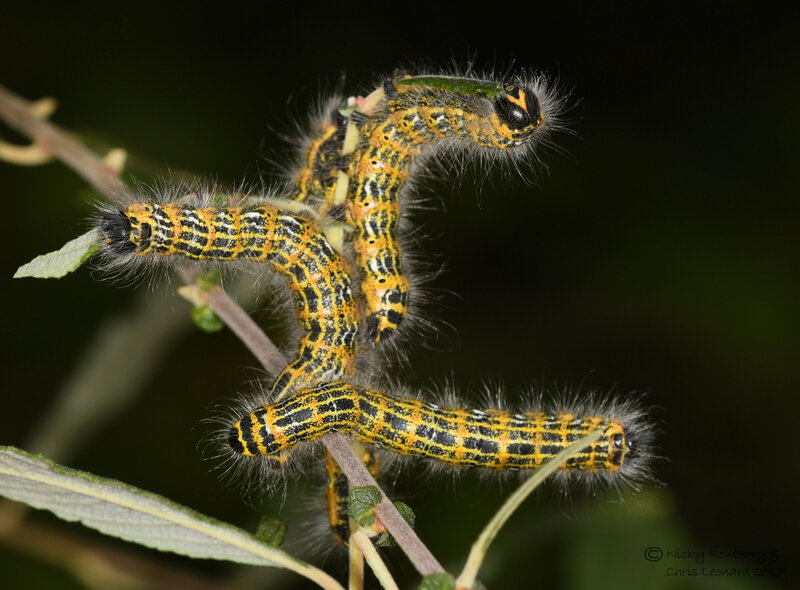 Their larvae live in water and are commonly known as rat-tailed maggots. 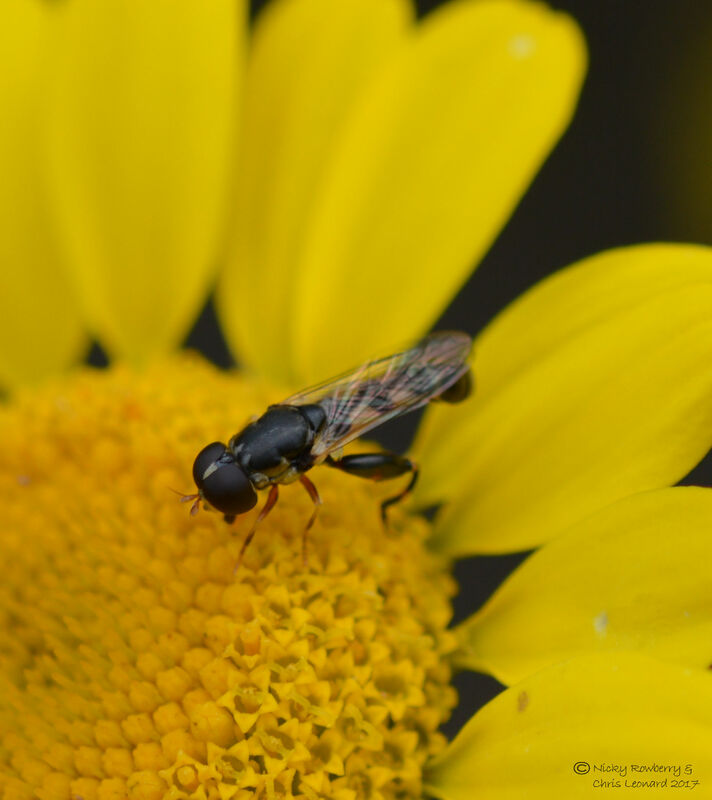 A much smaller more subtle one next Syritta pipiens – identifiable by the swollen segment on its hind legs. 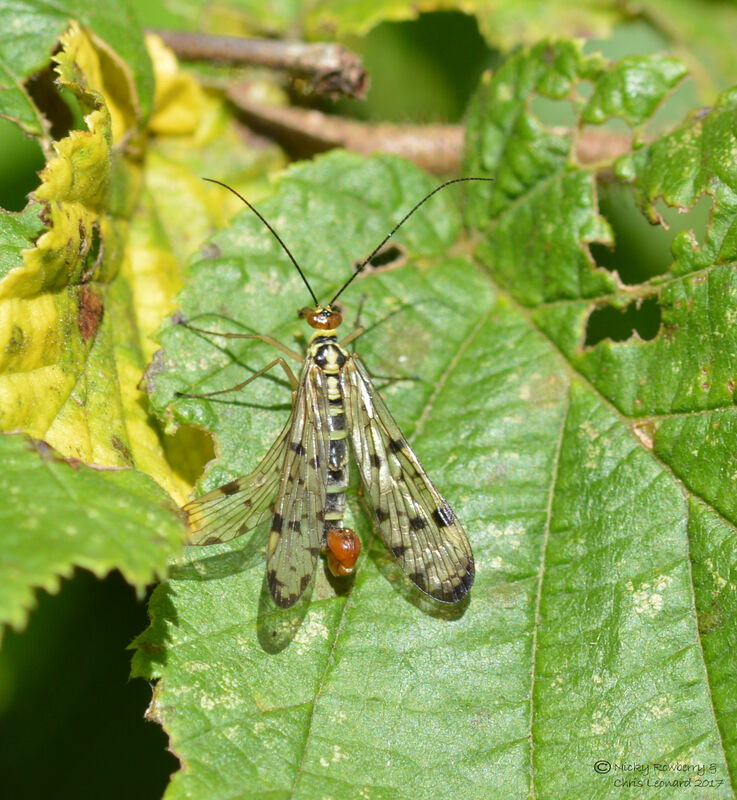 The next one is colourful but delicate one – Sphaerophoria scripta. 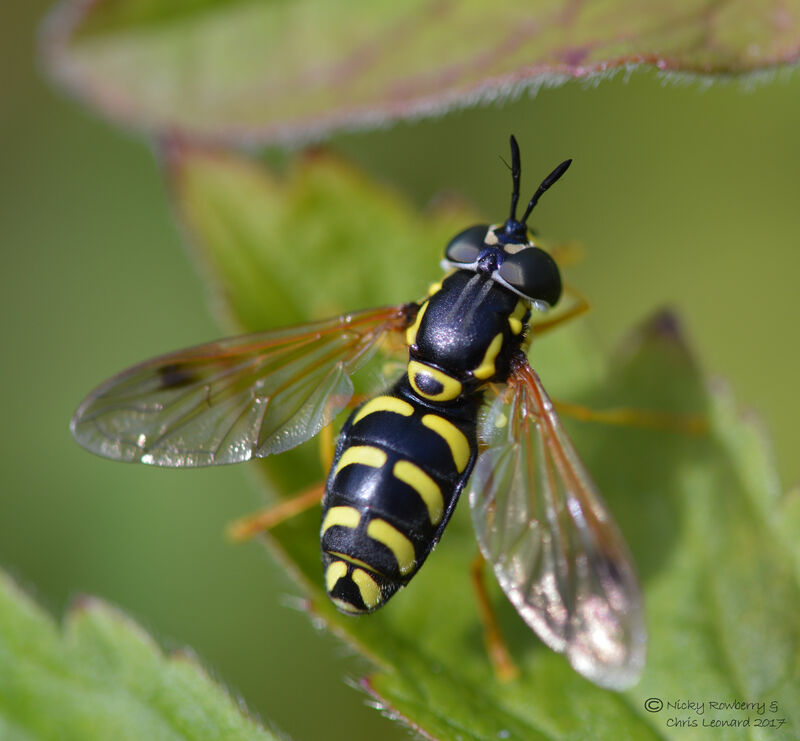 And finally my favourite of this set of 6 – Chrysotoxum festivum. 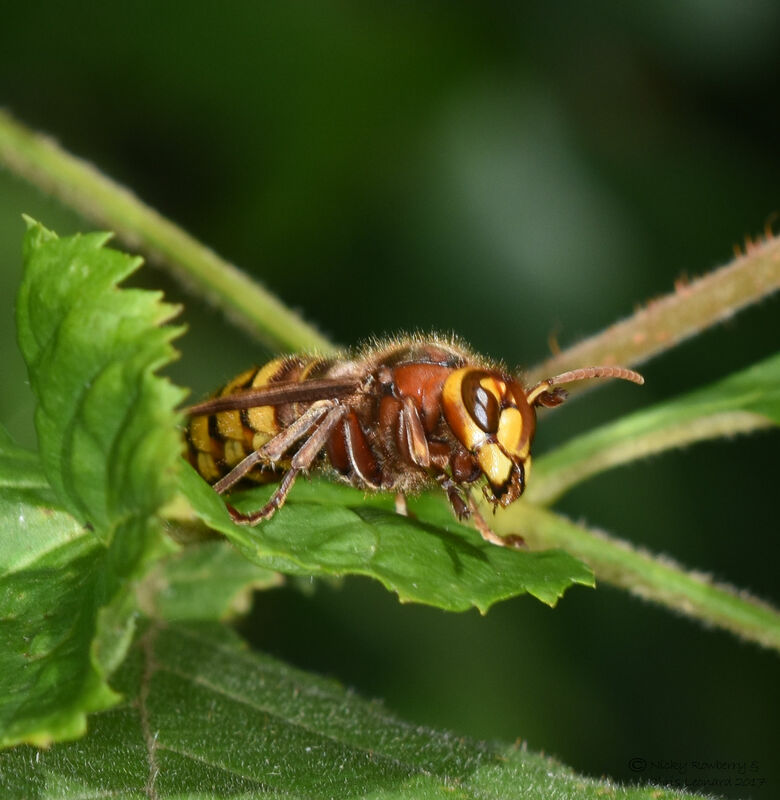 I love the markings on this one – they are known as wasp mimics for obvious reasons. Of course lots of other things besides hoverflies have been using the pot. 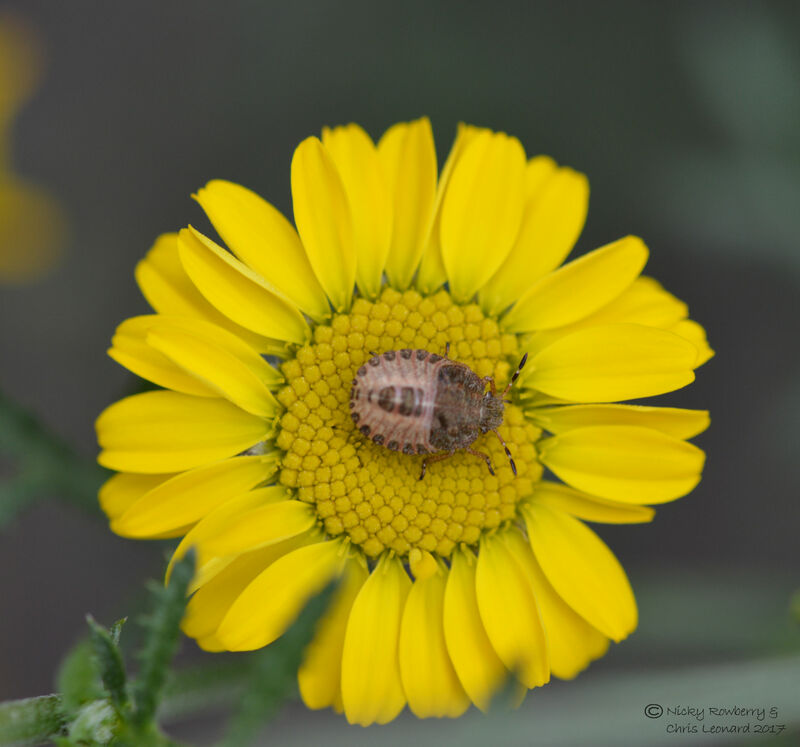 I couldn’t resist a photo of this cute little juvenile shieldbug sitting pretty in the middle of the flower. 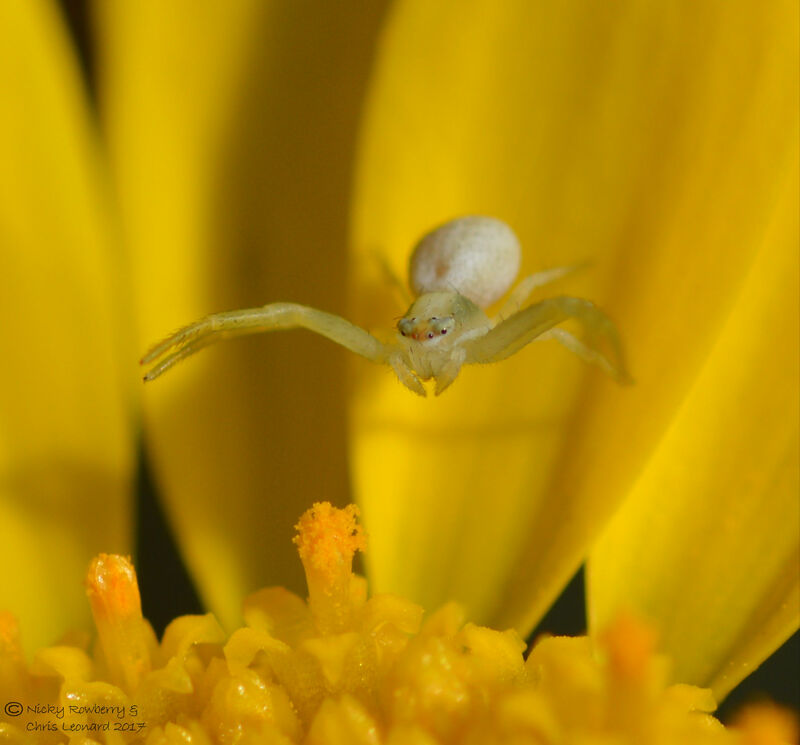 Not everything is all sweetness and light though – this crab spider may have been tiny but it was definitely lying in wait for any unsuspecting pollinator to come close enough for lunch. 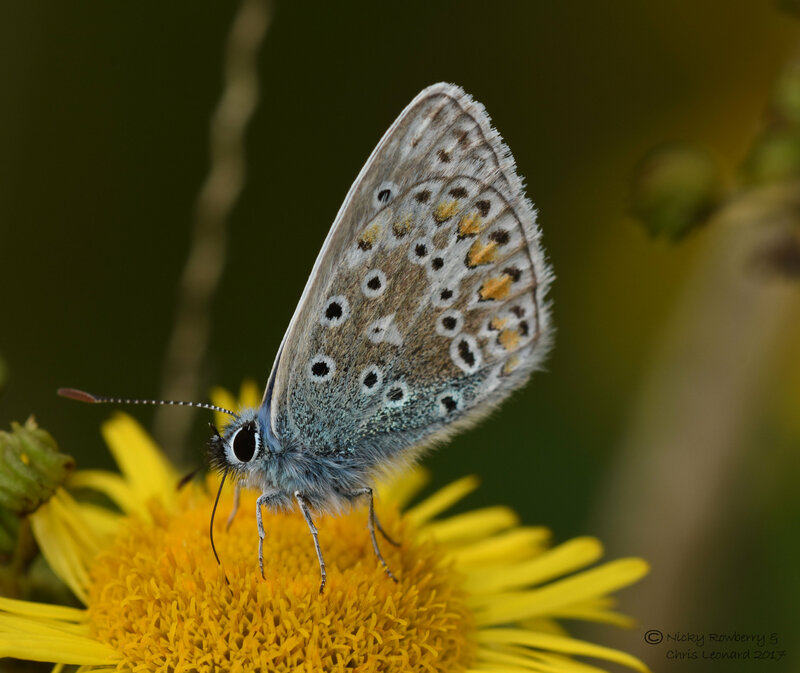 The star prize for visiting my pollinator pot goes to this Common Blue butterfly. 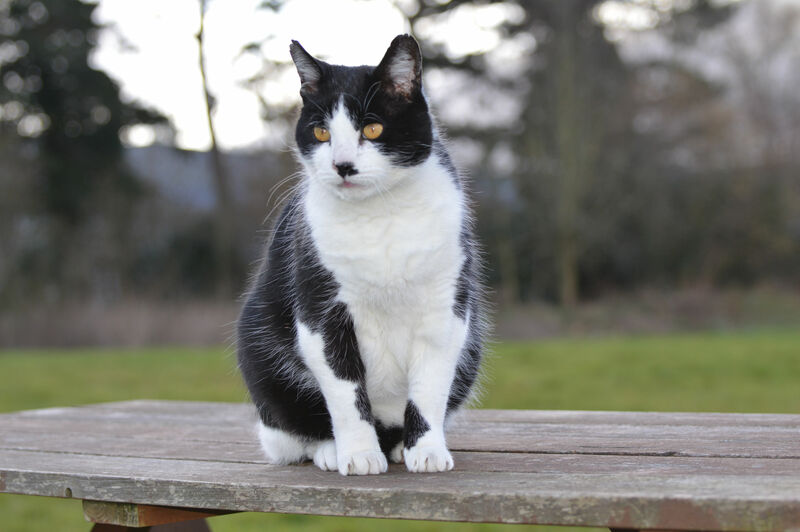 We’ve never knowingly had them in the garden before, so I was thrilled that the pot had attracted one. 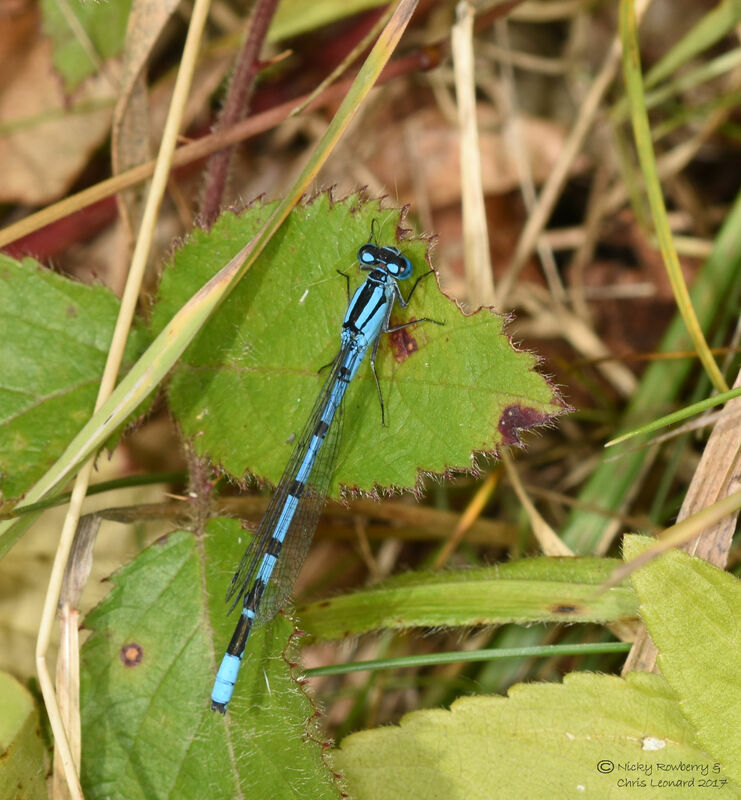 It didn’t hang around – hence the hastily grabbed photo, but just seeing this one insect alone makes it all worthwhile for me! 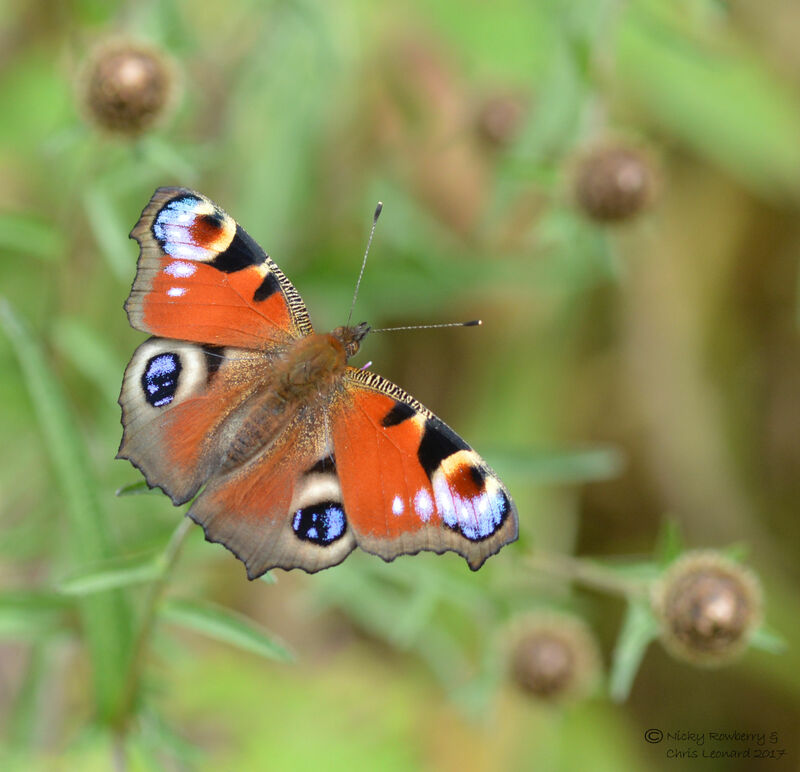 While on the subject of butterflies – it is Big Butterfly Count time of year. I’ve been doing counts both in the garden and down at the allotment, plus one at my Dad’s house. There’s still time to do a count if you haven’t already done so. 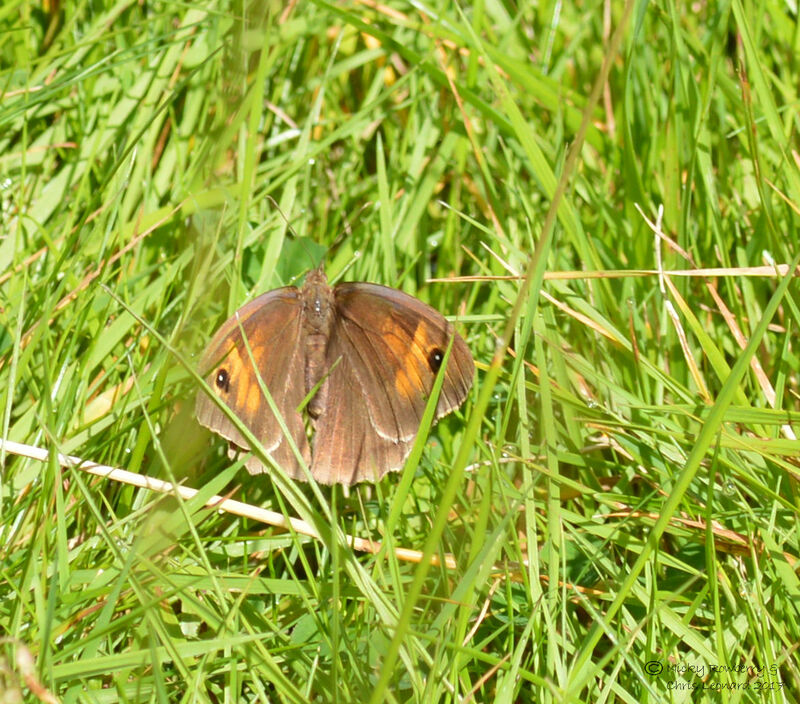 Besides the one-off sighting of the Common Blue, we have also been getting Meadow Browns (in the meadow that’s supposed to be a lawn!) 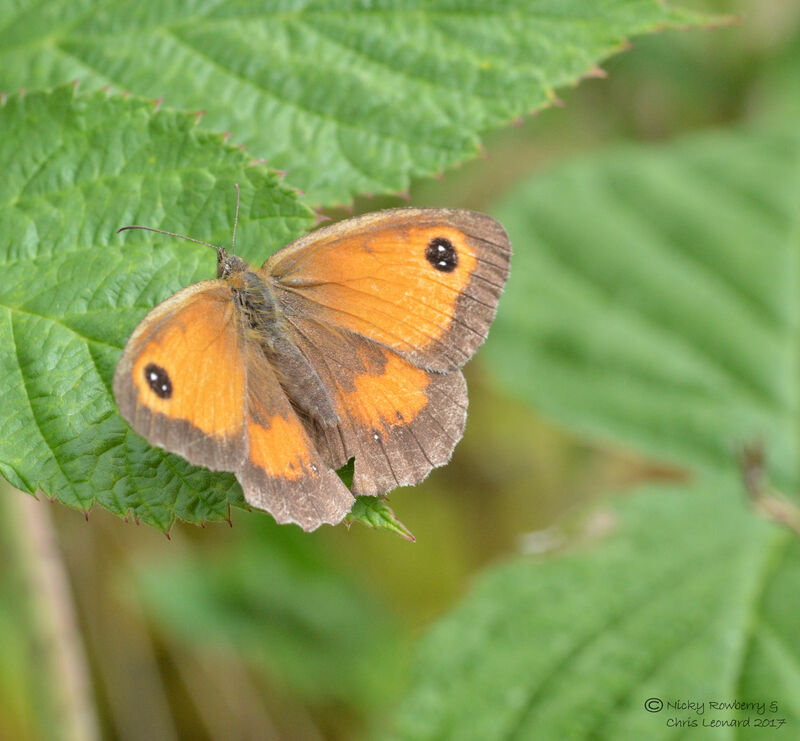 and Gatekeepers, plus the usual Whites, Holly Blues and the occasional Comma or Red Admiral. 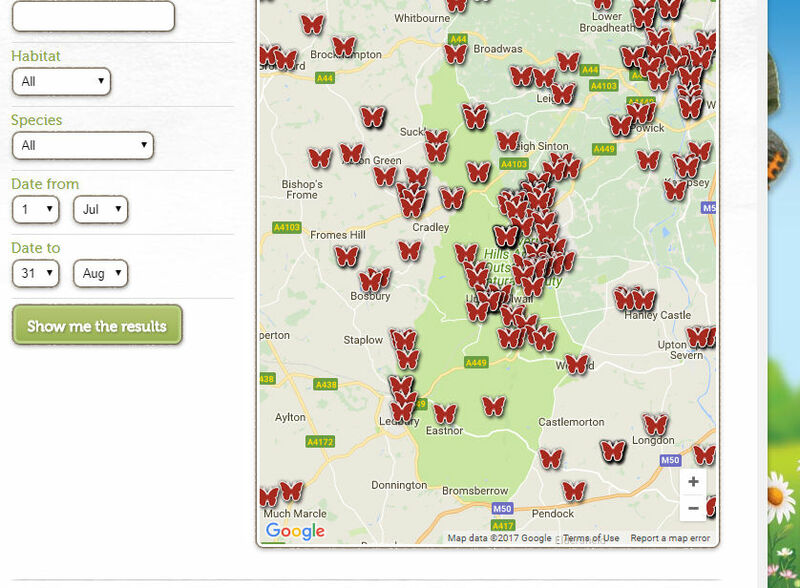 Last time I checked the Big Butterfly Count website they’d received over 40,000 counts. Here’s a snapshot of their map for the Malvern area – good to see I’m not the only one who’s been counting around here. 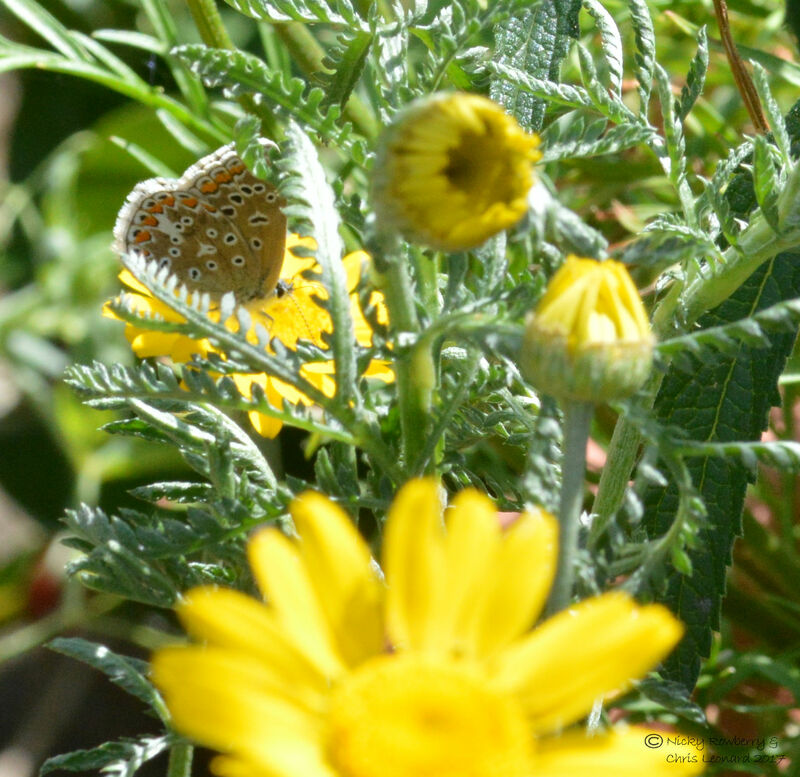 Enthused by the pollinator pot, I went hunting round the garden for other insect attracting plants. We’ve got a fair sized patch of Knapweed which seems to have seeded itself in one corner. The bees were loving it. There were quite a few leaf-cutter bees which was great to see, but almost impossible to photograph. So I gave up and concentrated on bigger bees that were more slower and more obliging. 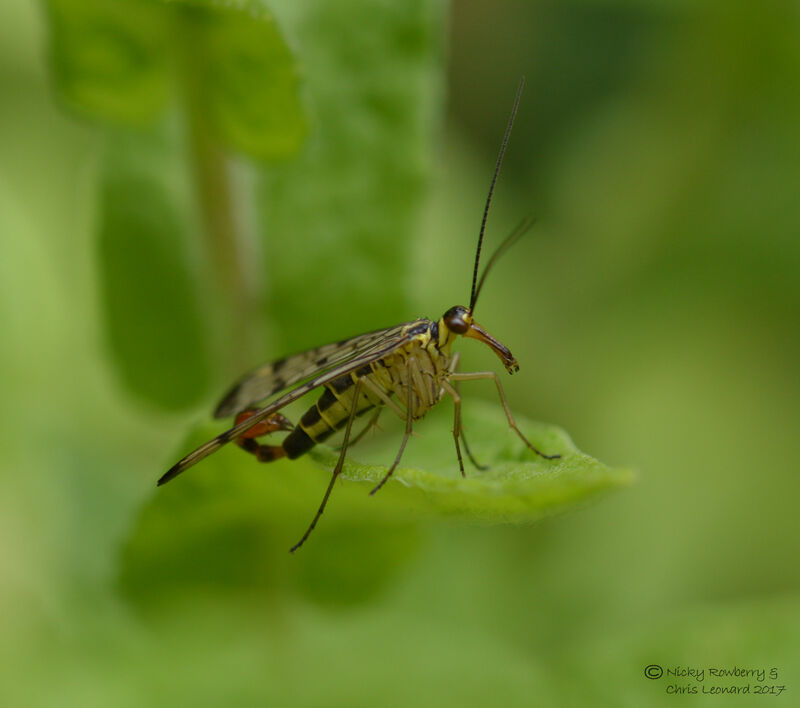 Aside from the usual bees, butterflies and hoverflies, I found this unusual looking insect. 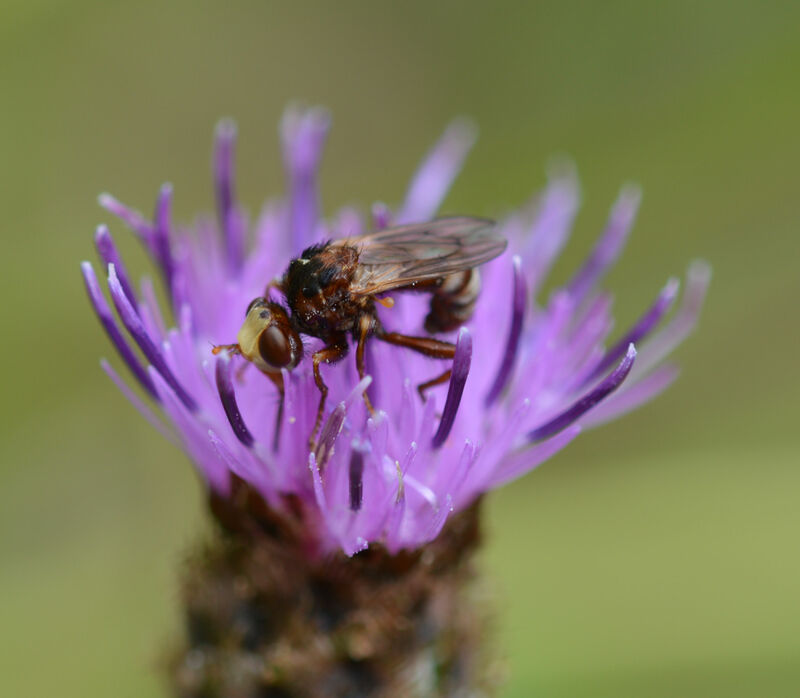 I had no idea even what group it belonged to, but turns out it was a Thick-headed Fly (Sicus ferrugineus). 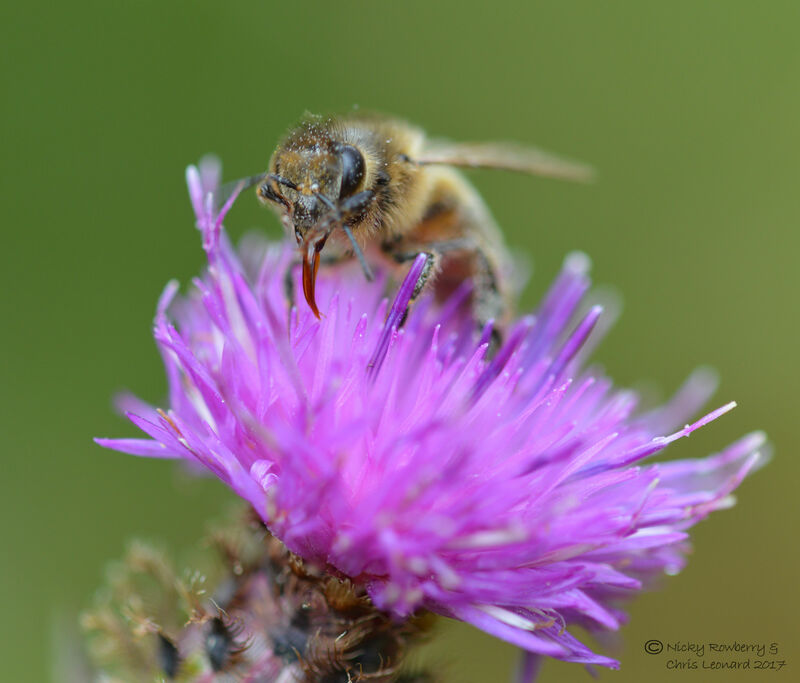 Unfortunately for our bees it parasitizes them, so not such a welcome visitor to the garden. 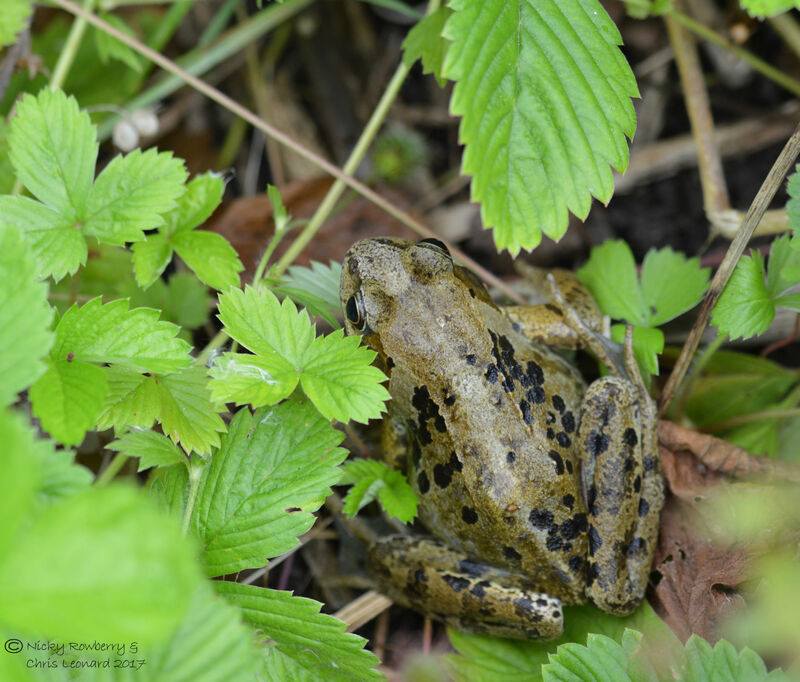 While stumbling around the garden chasing bees and flies, I came very close to treading on a frog. 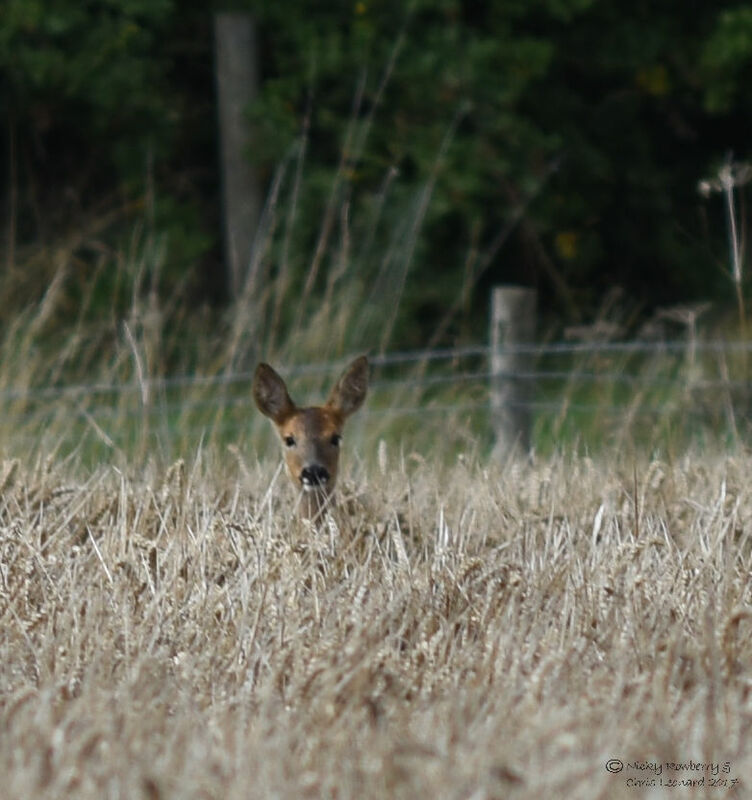 Fortunately his reflexes were quicker than mine and he hopped out of the way into our feral strawberry plot, but not before I managed to grab a photo. At the beginning of this post, I said it had been a mixed week for us. The good news was that Too Lazy To Weed has been shortlisted for the 30 Days Wild Blogger Awards 2017. I’ve read quite a lot of the other blogs and there are some great ones out there, so I’m really chuffed that Too Lazy was shortlisted. It’s nice to think that this means there are other people who are interested in the same things that we are. 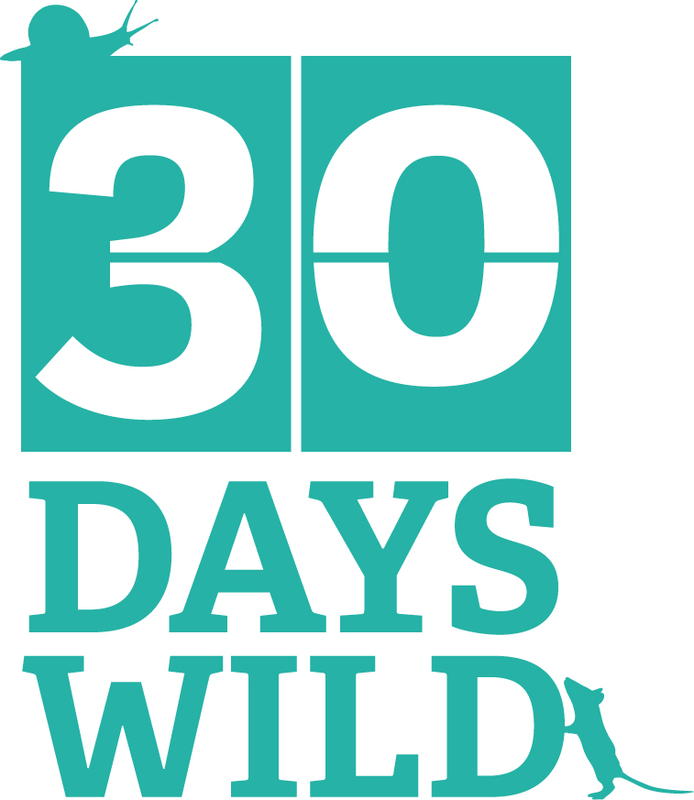 Good luck to all the other nominees – just participating in 30 Days Wild was a win-win thing, so none of us can really lose.